The Horsfield's Baron is a species that exhibits sexual dimorphism, in that the appearance of the male and female is markedly difference. The male has dark velvety black wings above, with a broad bright blue marginal border across both wings. The underside is a pale buff brown with light brown markings. The female is brown with markings resembling a Malay Viscount or a female Malay Baron. Males are territorial and return to their favourite perch again and again. Whenever an "intruder" enters its airspace, it will dive to attack it. 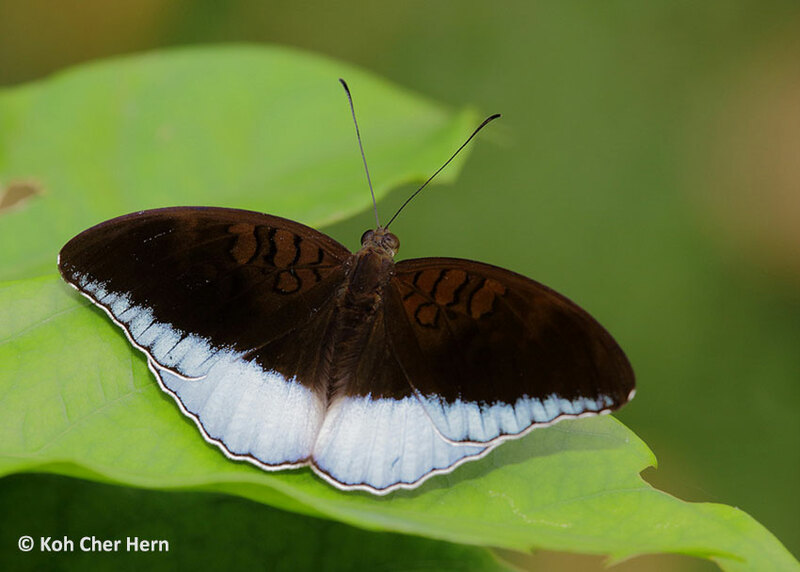 ButterflyCircle member Koh Cher Hern shot this pristine male in the forested area of a reservoir park last weekend. The typical behaviour of the male Horsfield's Baron is that it flaps and glides rapidly and stops on the upper surface of a leaf with its wings opened flat. Females prefer to fly amongst shrubbery, especially amongst bushes of the Singapore Rhododendron (Melastoma malabathricum) which is its caterpillar host plant.